Kronosight launched a Kickstarter campaign earlier this month with an easy solution to home security. The product, Sentri, is designed to be an easy do-it-yourself installation home security solution that can be used to monitor your home while you are busy living life. The Sentri looks similar to Apple products and within the first 48 hours, it had already acceded its $200,000 goal. As of right now, there are 706 backers and $236,968 in pledges. Due to popularity, Sentri is only accepting contributions of at least $249 since all of the $199 contribution levels have already sold out. Sentri is equipped with a learning algorithm that can track your living patterns and adjust accordingly. It will send you alerts when something out of the ordinary occurs. 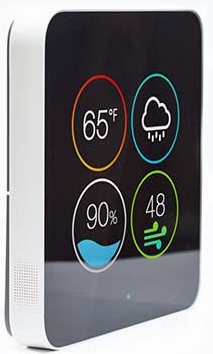 Sentri has a home screen interface so you can access information directly such as current temperature, humidity, weather, light detection, and air quality. The interface is one of the main selling points for Sentri. Since it does look somewhat like an iPod or iPhone (similar display, layout), it is something consumers are used to operating. Sentri’s competitors require the use of an app, but with the Sentri interface, users will be able to operate straight from the display. Sentri also has a built in HD camera, motion detector, microphone, speaker and night vision. The device is portable, and is only 9.4 inches in height and width with a depth of 1.5 inches. If Sentri continues to be successful, Kronosight plans to turn the product into “hubs” for third-party smart lights, locks, and thermostats. The potential doesn’t stop there. Sentri has the ability to connect to any device with an open API/SDK through Wi-Fi or Bluetooth. That ability allows for Sentri to be connected to so many other devices. With an endless potential, it is not surprising to hear that Kronosight is already in negotiations withOEMs to start production on Sentri. Kronosight is claiming to ship out units to the first contributors by May of 2015. The expected costs for Sentri units will run upwards of $350.